It's not often that I get to review fiction on this blog and it's the first time that I've been able to review young adult fiction. From the title, you'd think that the screaming stone is a fantasy novel but its not. Although there is some talk of mythology, the main events of the book are firmly rooted in reality. It's a mystery and adventure novel with only the slightest hint of fantasy. I found the writing style to be quite different from the breezy style of J K Rowling but J P Osterman has a long history as an English and writing teacher. She seems to have pitched the book at the early teen and older readers. At about 300 pages, the book isn't overly long and a lot happens within its pages. While this is a mystery/adventure novel, it's a long way from the formula fiction one usually finds in young adult books on this subject such as The Three Investigators, Trixie Beldon, The Hardy Boys and Encyclopedia Brown. This is good because although I'm not against formula fiction which is great for fledgling readers, it does tend to restrict the learning of older readers. The events in the screaming stone are far less predictable and the characters are "multi-dimensional and real. It's an obvious choice for reading development in kids who enjoy mystery fiction. The story is set in sixties America and it's mainly about two children in difficult home settings who embark on a treasure hunt through their family's past. There are lots of bits of Irish mythology and the Civil War. Being set in the days before everyone had mobile phones, GPS and the internet means that the mystery can be sustained for longer. J P Osterman seems to have taken quite a bit of her past and put it in the story. I get the feeling the main character, Marcie, is so well drawn because she really is the author at 13. I suppose that you're wondering why this review belongs on this blog? The character of Robbie very clearly has Aspergers syndrome. It's never explicitly stated in the book but his behaviour is obvious. He has obsessions, routines which need to be followed and at one point he even has a meltdown. Of course, Aspergers was not a diagnosed condition in the sixties and Robbie receives the sort of treatment provided to aspies in the day. In that sense, it's hard reading about a character who is misunderstood by everyone around him. Given today's tolerance and intervention, Robbie's life would have been so much easier. Author J P osterman is no stranger to Autism and Aspergers Syndrome with two children on the spectrum. It is nice to see that she doesn't feel the need to label Robbie but simply takes him as an individual and describes him as he is. It is us, the readers, who put the label on him. At the end of the day, its hard to say what makes the screaming stone so fascinating. Is it the mystery itself or the background and behaviour of the characters? I guess the appeal will depend upon your age and experience. Younger readers will be drawn to the mystery while older readers will find the character study more fascinating. I'd recommend the screaming stone to the more competent readers in your family (aged 13 and upwards). It's not just a young adult book, there's a great deal in there for us "older" adults too. The screaming stone is a great addition to the mystery genre for young adults and should effectively bridge the gap between formula fiction and adult novels. 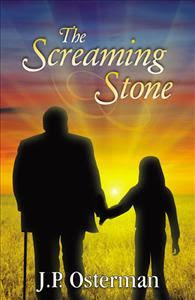 You can buy the Screaming Stone from various outlets including "Infinity Publishing". Honesty Clause: I was provided with an advance reader copy of The Screaming Stone at no cost for review purposes.